Regular Sea-Fever readers know I’m a sucker for maritime art and Shuli Hallak’s work first caught my eye in a recent NY Times Sunday Magazine editorial. 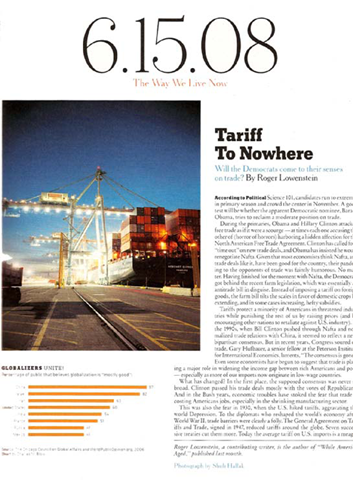 One of her photographs (below) was used in They Way We Live Now column which was entitled Tariff to Nowhere. So I was pleasantly surprised to run across even more of her work again today in a Moco Loco, The Modern & Contemporary Design Blog post. 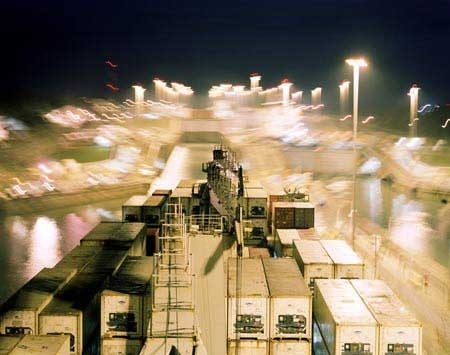 Shuli Hallak’s recent photographs document cargo in its state of transit between production and consumption. Almost every manufactured product humans consume spends time in a shipping container, yet consumers remain largely unaware of the process by which goods are actually transported. 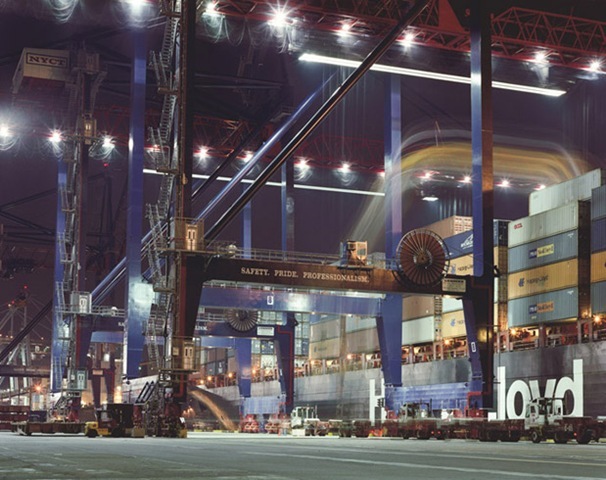 Hallak describes a cargo ship as a “sublime, moving city” and finds beauty in the fundamental necessity of the shipping industry, in the romance of travel over sea, and in the raw, precise, purely functional architecture of ports. In “Cargo,” Hallak unveils an essential stage in the delivery of goods from manufacturer to consumer and invites viewers to share in her process of discovery and in her fascination with what she finds. I love Hallak’s art; the beauty and magic of it and the ideas behind it. 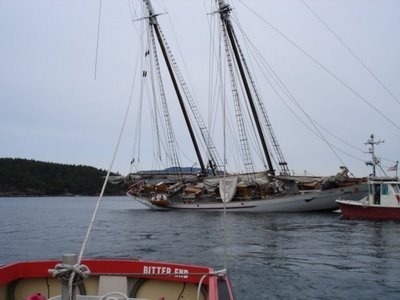 Monday was a bad day for historic schooner groundings on both coasts of the United States. Tragically, another historic schooner, Robertson II, met her bitter end last year in similarly treacherous waters off the coast of Washington state. The U.S. Coast Guard station in Eastport, Maine, says it received a report Monday night that the schooner Sylvina W. Beal had run aground near Indian Island in Head Harbor Passage and needed help. he Coast Guard evacuated the (41) passengers from the 25-metre-long vessel. No injuries or pollution are reported and the coast guard says the vessel is not taking on water. The good news is that there were no reported injuries, significant damage or pollution in either incident. Posted on June 23, 2008 June 22, 2008 Author Peter A. MelloCategories life, Values, Vision, workLeave a comment on Monday Morning Motivator: K.I.S.S. Donovan Hohn wrote a disturbing article for today’s (June 22, 2008 ) Sunday NY Times Magazine entitled Sea of Trash. It’s amazing how much plastic waste can wash ashore in a place where no people actually live. This is not a good sign for our planet! Hohn’s article reminded me about my first hand experience with litter at sea in beautiful Southwold, England. Here’s a link to my post from Blog Action Day 2007 – Litter@sea: A tragedy in the making. 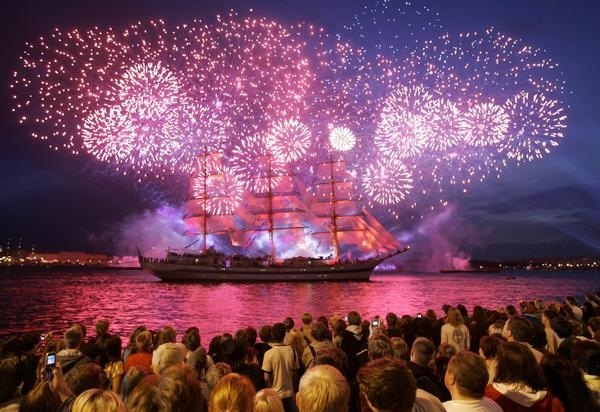 tall ship Mir Celebrating graduations across Russia! 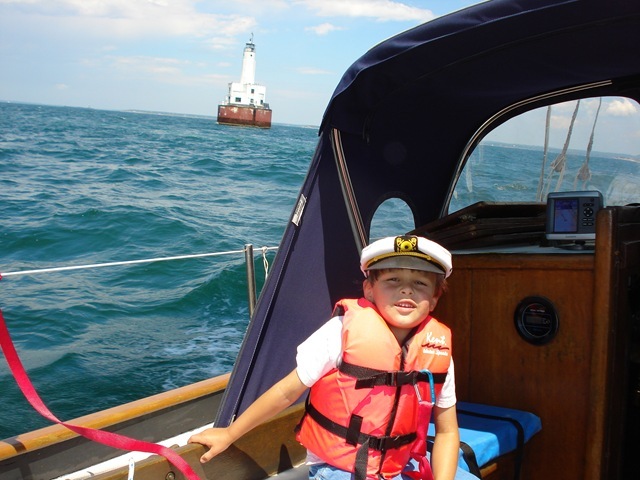 Posted on June 22, 2008 June 22, 2008 Author Peter A. MelloCategories Education, maritime heritage, sail training, tall shipsLeave a comment on tall ship Mir Celebrating graduations across Russia! On Thursday we got a call from Luke’s (5) daycare that they would be closed on Friday because electricity had to be turned off in that part of town for a few hours. A little while later my mother called to say that she couldn’t babysit Joy (3) like she does every Friday because she and my father had to attend a funeral. My wife Jenny has been extremely busy with work over the past few weeks so that left me to entertain our little people. Uh, oh! Thank god for friends! More on that in a bit. Thursday night Luke and I took my podcasting partner, gCaptain CEO/blogger and friend Captain John Konrad with us to a book signing at The Book Stall in Marion. Another friend, Randy Peffer, is an English professor at Phillips Academy Andover and prolific author. His newest book is titled Old School Bones; fortunately for Randy, but unfortunately for us, the book signing was so successful that he ran out of books by the time we arrived so we had to back order it. Randy also has several great maritime themed works including Watermen, a classic, and Logs of the Dead Pirates Society: A Schooner Adventure Around Buzzards Bay, one of my all time favorites. 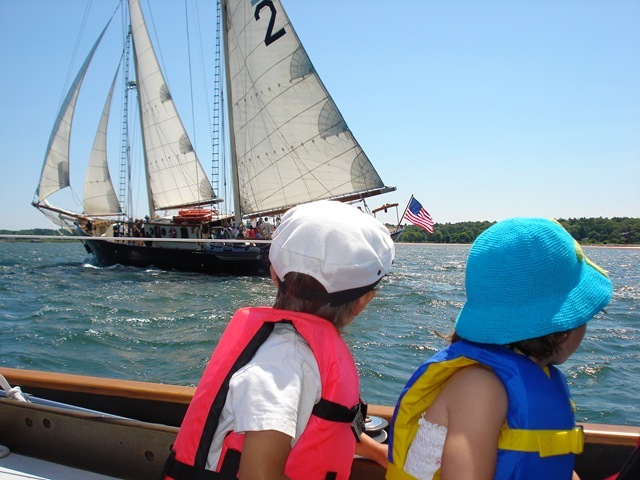 As its name suggests, Logs chronicles a sail training adventure with Andover students around Buzzards Bay on Randy’s Nova Scotia schooner Sarah Abbott. He also has a US Civil War maritime series coming out later this year. Randy writes! At the book signing Randy asked if we wanted to go sailing Friday. Well, Captain Konrad unfortunately had to work but the little people and me were free so we took him up on the offer. Saved by sailing! Those are all great books for your maritime library. Of course, make sure you also have Watermen and Logs of the Dead Pirate Society too! Finally, if you need more to read this summer, Bookmarks Magazine had a great article in August 2006 entitled 101 Crackerjack Sea Books by Dean King. This list should keep you busy for a while! Posted on June 20, 2008 June 20, 2008 Author Peter A. MelloCategories life, workLeave a comment on Begin WeekEnding!